When Sharon, a fellow Sydneysider, left a comment on the last post saying that she had already received her March Burda in the mail I thought I had better get started on this Burda lite challenge I've set myself before I get three months behind without even starting. Luckily the March issue hasn't arrived at my house (which is a little annoying too), although the subscription renewal has - ironically the subscription is through a company called Speedimpex Australia, ha not so speedy at all! 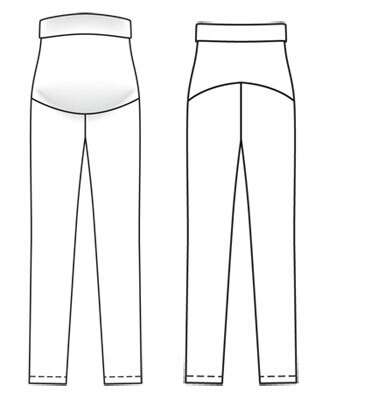 It's a simple pull on, jersey knit waistband pattern made in the style of kid's pants: sew the two legs separately, put one leg inside the other right sides together and sew the centre back seam, crotch seam and centre front seam in one 'u' shaped sewing line. Then just sew on the waistband and within an hour or two you're all done! Well that's the theory anyway, I still had some fitting issues to resolve because the centre back of the pants had major gaping that I didn't think the waistband would pull in, at least not in a flattering way. So I took a pinch out of the centre back seam, and sewed two small darts in the back as well to get the pants to fit closer. These are really comfortable, but I see now from these photos that they aren't so flattering, which actually is normal for me in pants anyway what with my pear shape and sway back. It's funny how when you try something on and look in the mirror things look ok, but when you see a photo from all angle it's suddenly obvious how they really look! Oh dear, my backside really has expanded a great deal, and my hips/saddle bags are even more pronounced in this cut, fabric and colour but you know what? At 38 weeks pregnant I just don't care, these pants provide coverage and comfort and that's good enough for me at this point in time! For anyone else contemplating making these (and a note for myself in case I ever do something silly like get pregnant again) the changes I would make to the pattern would be to increase the centre back rise because they sit quite low and the waistband is quite visible unless you wear a really long t-shirt, and to decrease the centre front rise because these bunch up a little under my belly although that would depend on how high or low you're carrying. So I'm patting myself on the back for finishing the first step in my challenge so quickly, now to change the thread in my overlocker and make the January pattern so I can get back to the other things sitting patiently in the queue. Yay! New pants! Yay! Only two weeks to go! 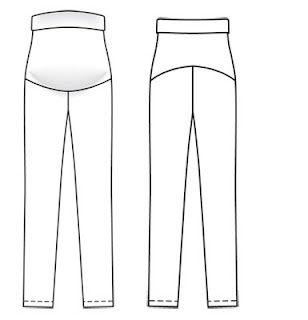 My mother's maternity pants patterns have a big "U" shape cut out for one's belly, and a drawstring to hold the back and sides up around the "waistband." No coverage at all for the baby bump -- you wore an enormous smock over the top to cover yourself. She says they were comfortable. I doubt it ... Happy Rest of Your Pregnancy! Alas, 38w pg... it is a nice colour on you, and honestly the rest of the world will just be marveling at the marvel of a 38wk pg body than wrinkles on some trousers. Did #1 come at 40w? My 40w date came and went both times. DS decided to make his entrance at 41.5wks. Nice work on the pants! And seriously, who could begrudge comfort to a 38 weeks pregnant woman? You look fantastic and I am so impressed with your productivity at 38 weeks! You are taking this pregnancy in your stride, and I hope that bodes very well for an easy labor and restful early days with your new little one. Great pants. I think you look amazing in those photos. Its pretty obvious from the last shot that you are mostly baby. Happy home stretch there on the pregnancy! You totally look ready to deliver. You cutie... you look great! Good for you... one down one to go.... (that is until you get the "next" Burda...LOL)It's never ending isn't it! Seems there is always something else on the list! Thanks for visiting my blog/commenting... my mom is doing better. Good job on the pants.. always nice to have something cute to wear... especially when preggers! Two weeks... I'm excited for you! Kinda like another Christmas hmmm? How is DH hanging in there? Give Anna a hug from me! I like your attitude because seriously you are entering the end of the pregnancy and you need comfortable clothes to see you through. If these work and you feel good wearing them, go with it. There are days when I need these pants. You are blooming! Bets are on for a boy. You manage to make everything looks so effortless and pretty. Those are actually pretty great pants! They look normal and then they have the stealth pregnancy band. Hope you're getting good use out of them (or not, if you're happy about the warm weather--not sure about 38 weeks + hot temps! ).